Flat roofing systems are a common sight across many areas, especially on commercial, industrial, and institutional buildings. This is mainly due to the fact that they are easier to install over large surfaces. But that is not the only reason flat roofing systems are a good choice. Take a look at some of the many advantages of a flat roofing system. Flat roofing systems are definitely one of the most cost-effective options for a roof. With the proper materials and expertise, a flat roof is an investment that will give back to you for many years to come. Flat roofing has proven time and time again to be a viable alternative to pitched roofing. When you factor everything in, including the affordability of maintenance and upkeep, flat roofing systems just make sense. Aside from the lower cost, flat roofing systems look great. 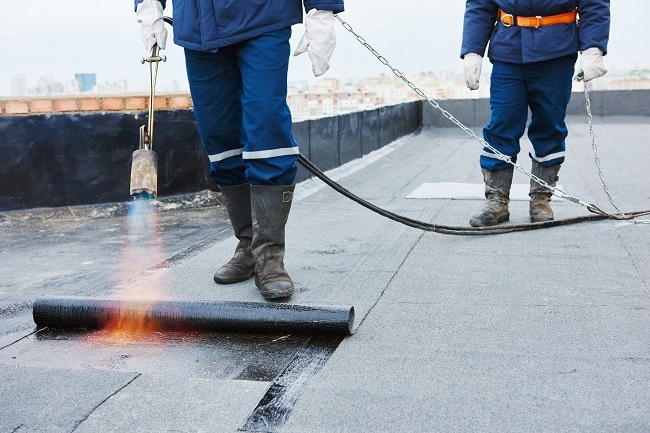 If you want to give your business a good, clean look, a flat roof will do the trick. Flat roofing can help to complement any landscape or cityscape without obstructing its view. And definitely don’t forget that flat roofing gives you the ability to make use of the space on the roof. This means that you can hide unsightly equipment up there, such as air conditioning units, satellite dishes, and more. You even have the ability to turn the space into something you can enjoy as well. Just make sure that the roof is designed with the necessary safety measures, including the ability to withstand the extra weight. While flat roofing systems have many amazing advantages, you’ll have to ensure that they are equipped with the proper drainage solutions in order to prevent pooling water when it rains. Water that is left standing on the roof for a long period of time can lead to leaks and damage. As long as the roof is installed properly, as well as maintained properly, it’s an investment that you will not regret. Please contact us as Vera Roofing & Construction for more info.